'Building Your Home: A Simple Guide to Making Good Decisions' is based on the authors’ extensive experience as an architect and project manager, designing and managing the construction of large estate homes. You will have to make lots of decisions in this process. There is no way around it .... so be prepared. Each time you make one decision, know that there is another decision right around the corner. 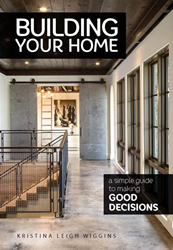 Building Your Home: A Simple Guide to Making Good Decisions (Brown Books Publishing Group) is exactly what it says it is. Author Kristina Leigh Wiggins breaks down each initially overwhelming decision and provides all options, from small scale to big picture, allowing readers to effectively focus on one element at a time. The book is based on her extensive experience as an architect and project manager, designing and managing the construction of large estate homes. Her friendly, encouraging, and at times humorous tone puts her clients and readers at ease despite the daunting journey they are about to undertake. “Building Your Home continues Brown Books’ long tradition of publishing books from leading experts in their fields. We are thrilled to have worked with Kristina Leigh on this exciting project that will help people achieve the home of their dreams,” says Milli Brown, founder and CEO of Brown Books Publishing. The key to good decision-making is having a master plan that encompasses not only your current needs and budget, but also considers your future dreams for the house. Identify those items early so that as your life evolves, so can your home. Wiggins reveals comprehensive and easy decision-making strategies for prospective homeowners as well as guidance on negotiating relationships with architects, builders and interior designers. Building Your Home is a homebuilding manual, workbook and keepsake combined; the one-of-a-kind guide is based on discovering your personal needs, limitations and goals. Keep your sanity by making the most of every decision you face during the homebuilding process and consciously basing those decisions on your lifestyle, daily routine, personal style and master plan for the future. Get even more organized by downloading Simpleigh Done, the complementary mobile app that works in tandem with the book. For more information on Kristina Leigh Wiggins, her book and mobile app, please visit http://www.SimplyKristinaLeigh.com. Building Your Home author Kristina Leigh Wiggins is available for media interviews, panel discussions, speaking engagements and guest appearances.